After living in Florence for 3 years I'm still overwhelmend by the boundless repetoire of cultural events the city has to offer. I often find myself having to make trade-offs, because the choices are so many and so diverse. Additionally, over the past few years, Florence has expanded its role as host-city for various extraordinary international world-class events, making for an ever-growing list of rich and often unique options. Florence is one enormous cultural amusement park that changes every day and I am an addicted participant. Just today, the city of Florence announced 2700 cultural events taking place here in 2012! ﻿﻿This weekend offered a long list of one-time events, but the choice was very clear. From Friday through Sunday, Florence played host to the first World Bach-Fest, two full days of round-the-clock, nonstop music, master classes, films and concerts dedicated to Johann Sebastian Bach and brought to life by Ramin Bahrami. I attended the opening night inaugural concert at Teatro Comunale and was afforded a VIP seat through my acquaintance with a friend and opera critic which made it an especially rich learning experience for me. For the next two days and straight through Saturday night, Palazzo Vecchio staged an extensive array of musical performances presented by the world’s top Bach experts, making for an outstanding first-ever musical manifestation. Ramin Bahrami after signing his CD for me! ﻿﻿I was among the first to arrive early on Saturday morning to secure a seat and receive my entry badge. 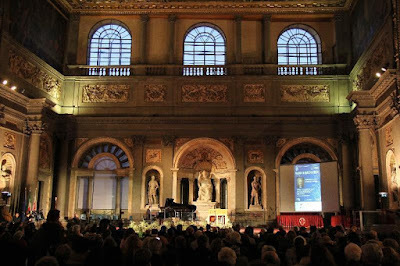 The event was open to the public but limited to 500 seats in the Salone dei Cinquecento. Hypnotized by the music, the genius of the musicians and especially the budding young talent, I lost all sense of time and became affixed to my seat for hours on end, as time stood still. I don't think the organizers or anyone in Florence expected such an overwhelming turnout. The 500 seats were exhausted by 10am. As the day grew longer, hundreds of people waited in queue in Piazza Signoria for hours, hoping for some way to get in. But the limit of 500 was strictly enforced. Luckily, there was a big screen mounted above the Loggia dei Lanzi which availed a glimpse of the action taking place to those observers in the piazza. I just heard today that the total turnout was 8,000 people! ﻿﻿﻿﻿﻿﻿I didn't get much sleep during this nonstop musical weekend but was able to sneak back and forth home to take in a few power naps without losing my seat in the wee hours of the morning. It was a unique opportunity to spend day and night within the sacred walls of the Salone dei Cinquecento surrounding myself with some of the world's greatest musical talent. A chance that may never happen again. For me, the highlight of this magical musical weekend was the opportunity to observe the master classes given to young budding Bach musicians by Ramin Bahrmi. It was my first time ever seeing a master class of this caliber in person and thus was very special. ﻿I must admit that on Sunday, instead of sneaking back home for a power nap, I snook back and forth on my bike over to Stazione Leopolda to get a "taste" of another weekend-long fest, the "FuoridiTaste", an annual food-tasting fair catering both to the gastronomic trade and Italian foodies alike. It provided the perfect pause from the many hours spent at the Bach-Fest and allowed me plenty of stretching, tasting and digestive time in-between the concerts and presentations at Palazzo Vecchio. With a little bit of clever planning, I was able to enjoy two unique events this weekend for the perfect musical-culinary combination.....a delight for all of my senses.